Cowcaddens Street Main entrance from 1867 to 1880 (not Hope Street). 1957 Alteration/conversion Converted to Scottish Television theatre. Clarke & Bell Architectural practice A 1867 Original building - Bell responsible. Alexandra Music Hall Accomodation for 700. 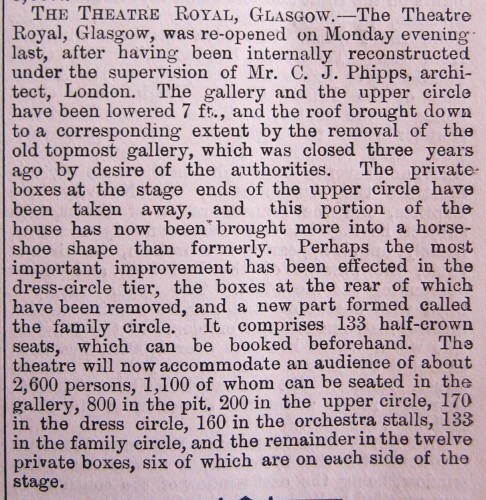 Was part of the Theatre Royal Buildings in Cowcaddens Street at Hope Street, sitting over the theatre entrance corridor in Cowcaddens. Wordsall Collection, Ref T1309/A/460. Dated 1/5/1924.